A report released today by Ireland’s largest multinational CRH confirmed the global cement giant has divested from its 25% stake in the Israeli cement market. The company has been a focus of a sustained campaign calling for such a divestment from the Ireland-Palestine Solidarity Campaign (IPSC) and other groups for over a decade, due to role its Israeli subsidiary Nesher Cement plays in supplying materials for the building of Israel’s illegal separation wall, checkpoints and settlements. That 25% stake was held in the Mashav group, the holding company for Nesher Cement, the sole producer of cement in Israel. Nesher is involved in the building of the separation wall in the West Bank which annexes Palestinian land to Israel, and has been declared illegal by the International Court of Justice. Nesher’s actions support and sustain the ongoing Israeli military occupation of Palestinian land. Nesher Cement is also used in the construction of illegal colonial settlements in the occupied territories, checkpoints that impede travel and commerce for Palestinians, and more than 700 kilometres of Israeli-only roads in the West Bank (See the Who Profits? website for details of Nesher’s involvement). For more than a decade the IPSC has been campaigning for CRH to divest and end its complicity in Israel’s serious human rights violations and war crimes. 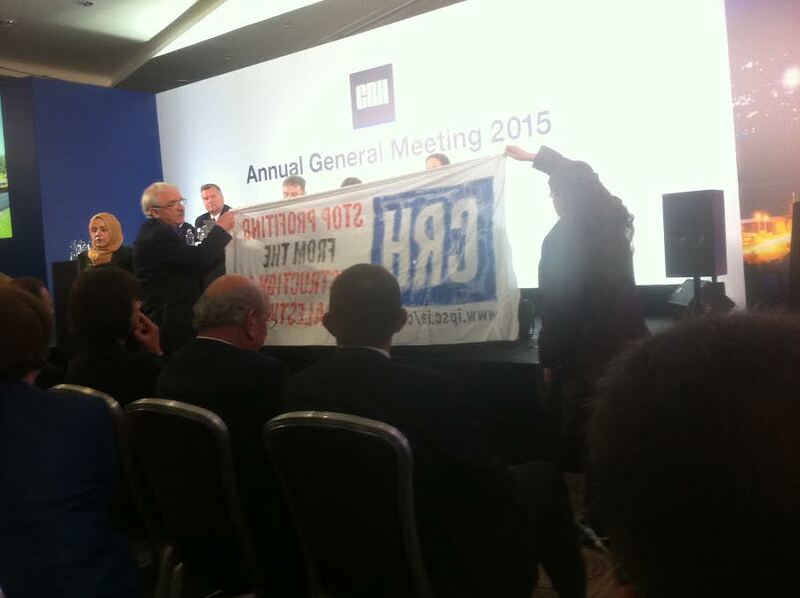 The issue of CRH’s complicity due to it’s Israeli investment has been consistently raised in the proceedings of Annual General Meetings by IPSC members who are also shareholders in the company, as well as in colourful, creative and lively demonstrations outside these meetings. In 2012 the IPSC presented a 10,000-signature strong petition to the CRH Board calling for divestment, and also filed a complaint with the OECD. 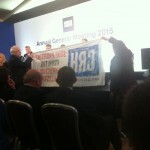 Last year IPSC shareholders unfurled a banner inside the AGM reading “CRH: Stop Profiting from the Destruction of Palestine” and asked the AGM to observe a minute’s silence for the thousands of victims of the 2014 Israeli assault on Gaza. 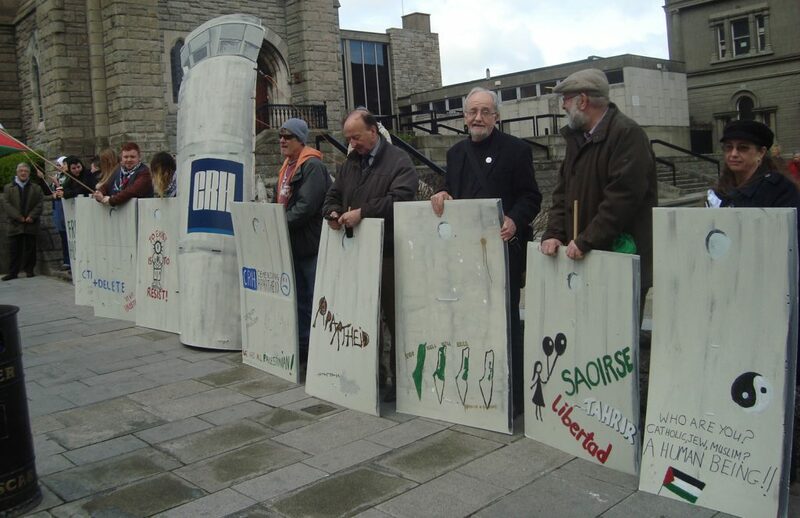 Other actions included a travelling mock checkpoint roadshow which highlighted CRH’s role in the wall to the Irish public, working with Palestinians on the ground to highlight the issue locally – particularly in Bi’lin village – and bringing the issue to the Russell Tribunal on Palestine. “This divestment is just the latest in a number of high profile victories for the global Palestinian-led Boycott, Divestment and Sanctions (BDS) movement. In August last year the French multinational Veolia, which the IPSC also campaigned on, pulled out of its Israel operations which included operating a tram service to illegal settlements. Earlier this month, the communications giant Orange dumped its Israeli affiliate, which had backed the Israeli assault on Gaza in 2014 and ‘adopted’ a military unit. ‘Brand Israel’, it seems, is becoming increasingly toxic and it appears that international companies are eventually learning that it doesn’t pay to do business with the Apartheid state,” Mr. O’Quigley concluded. “Since October, tens of thousands of Palestinians have taken to the streets to protest Israel’s accelerating ethnic cleansing and apartheid policies. Thanks to the global BDS movement, we are seeing the strengthening of a trend where major corporations and investors are realising that being associated with Israeli apartheid and settler-colonialism is bad for business. We warmly thank and congratulate the Ireland Palestine Solidarity Campaign and all those involved in the campaign that through their effective solidarity are strengthening our struggle for justice, equality and freedom,” concluded Mr. Juma’. The BDS movement, Palestinian civil society’s movement for freedom, justice and equality is beginning to seriously bite for Israel. According to the World Bank there was a drop of almost 25% in Palestinian imports from Israel in 2015. A UN report showed that Foreign Direct Investment plummeted by almost half in 2014, partly, the report concluded, due to the growing strength of the BDS movement, while an Israeli government report said that exports of weapons systems and Israeli-developed arms technologies were down by 13% in the same period. The latest available figures for 2015 show that Israeli diamond exports fell 25%, exports of goods were down 7.5%, and exports of services slumped by 3%. A leaked Israeli government report estimates that BDS could cost Israel’s economy $1.4bn a year, while a study by the Rand Corporation states that BDS could cost Israel between 1 and 2 per cent annually over 10 years. Israeli officials view the growing BDS movement as a major “strategic threat” to its apartheid settler colonial regime – so much so that it has created a ministry to fight the campaign, and poured millions of dollars into its propaganda and sabotage efforts.